Nasturtium Flowers – Patient Spider! Just one of those regular sort of days, wandering around the garden and not looking for anything in particular. I am fond of the Nasturtium growing in Plot 1 – Lovely cherry red flowers all Spring and Summer, great for reducing weed growth, and a magnet for aphids and other nasties that would otherwise be eating my vegetable plants. A good reminder that a healthy garden is one that is shared with many creatures, no one more than the other. What do you find hiding in the garden? Tags: flower, garden, Nasturtium, spider. Bookmark the permalink. Hi Donald – I had a look here to a site about Orb spider and think you are correct. Yes they are a great spider to have in the garden, and a sign of a healthy environment. 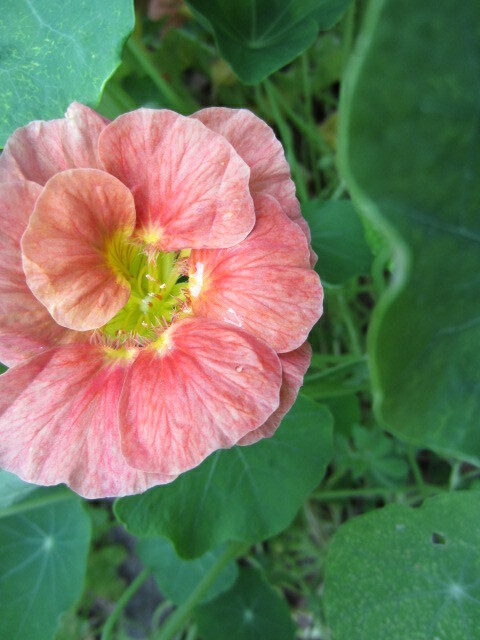 Thanks for stopping by to see the Nasturtiums! Has anyone ever heard of using nasturtiums to keep squash bugs off of squash plants? Have also found that a soapy spray works well, just like it does for aphids. Keep knocking them off the squash until all dead or they give up! Thanks for the information and the website. You are very welcome Jan. Are you growing nasturtiums at the moment? No, I’m not growing nasturtiums at this time. Someone advised me to spray tobacco juice on squash plants and around the area so I am going to try this. Well please let us know how that works out Jan.
Had one of those only bigger, and it bit me! As long as it wasn’t you he was waiting for! I use nasturtium flowers as an herb on pizza and I don’t know how many times I came across a daddy-long-leg spider just chillin inside a flower I was about to pick. I guess the odd shape of the flower makes for a good hideout to try and catch those awful aphids and other critters. I just love nasturtiums and wish I could grow them year-round but there’s just not enough warmth or sunlight here in PA for them to really thrive, even indoors. As a herb on Pizza! Sounds like something to try myself, as there are plenty of nasturtiums around the garden right now. I have the same problem with the climate – too cold in Winter to get anything out of them, and lucky if they survive a prolonged cold period.